1. 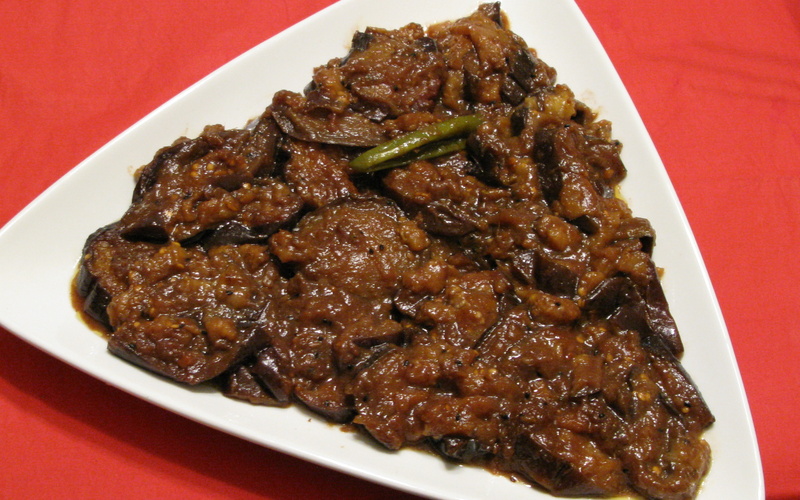 Cut the eggplant in 1/2 inch round slices, wash and soak in a bowl of warm water for 10-15 minutes. 2. Soak the tamarind from the packet (about 3-4 oz) in a small bowl for a minimum of 15 minutes (you need about ½ cup to 1 cup of water to soak the tamarind). The longer you soak it, the better the taste. 3. Sieve the eggplant and pat dry with paper towels. Add 1/2 tsp of turmeric powder and a little salt to the sliced eggplant. 4. 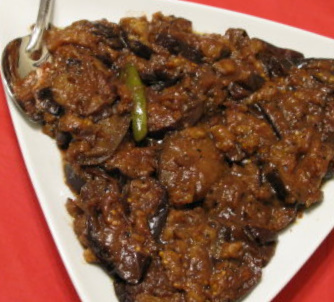 Fry the eggplant in a pan adding as much or as little oil as needed; or for a healthier version, in a bowl, add a little oil (2 tablespoons should be enough) and rub into the eggplants. Bake for 30 minutes at 350 degrees c.
5. In a separate bowl, add 1 tbsp of fresh blended onion. Add all spices as indicated above and mix well. 6. Prepare the tamarind by sieving it well and removing all seeds. 7. In a clean large pan, pour 1 ½ tbsp of cooking oil and turn the stove on to medium heat. Then fry the diced onion until slightly caramelized. Next, add the panch phoron into the Pan. Fry the panch phoron and onion for 1-2 minutes. 8. Pour the blended onion and spice mix into the pan and fry for 5 minutes. Add 1/2 cup to 1 cup of hot water from the kettle. 9. When the sauce is smooth like a paste, add the prepared tamarind, sugar and salt and mix well. Cook for a few minutes until the sauce is nice and thick. Taste it at this point to see if there’s anything more you need to add. You can make it as sweet or as sour as you like although “khatta” is technically a sour tasting dish. 10. When the sauce is ready, add the fried or baked eggplant to it and cook for a further 15-20 minutes on a low medium heat. 11. Add whole green chillies as desired and keep it on warm for 5-10 minutes. Recommendations: Serve with hot rice or bread of your choice.